PARENTING: Who Runs the World? Who runs the world? It’s a question asked by theologians and pop culture alike. It seems hat more than ever, people are caught up with power and who is in control. According to the Torah’s teachings, G-d runs the world. Although these days, it seems that it’s run by Russia, the media, Twitter, women, men, boys, girls—or a mixture of them all. either on auto-pilot or in utter chaos, this is intentional. G‑d created the universe and promptly concealed Himself within it. The less G‑dly something appears, the more concealment is at play. Conversely, while you take notice of a beautiful sunset, when a new baby is born or you partake in a mitzvah, you are experiencing G‑d revealed. This juxtaposition is by design, He is here, but He is hidden. This requires us to take notice. G‑d hardwired us to see our lives as mundane and contained within the so-called laws of nature, so that we are compelled to search Him out and find purpose, even where it seems there is none, within our personal life journey. When every one of my children was a baby, the first and favorite game we would play was “peek-a-boo.” I was constantly amazed by how thrilled each child would react to this simple game. My face is directly behind my hands, the baby can see my neck, my forehead and my chin, yet somehow, “boo!” and I am back, and it’s the funniest, most amusing pastime, delivering gaggles of giggles on demand. The child knows I am there, but it’s in the finding me that the greatest joy takes place. The Purim story, called Megillat Esther (or the Scroll of Esther) and its holiday have always been my most enjoyable. It is an authentic story of a “princess” and her heroism. It is the antithesis to the Disney caricature of feminine dreams and desires. Esther is a common girl with no aspirations for a handsome prince to drive her off into the sunset with a happily ever after. She is taken against her will to the palace, inexplicably chosen by the king over all the more suitable maidens in the vast kingdom and remains there in the harem of King Ahasuerus or Achashverosh. Meanwhile, the king has a wicked vizier named Haman, who is filled with hate for Mordechai, the Jewish leader. Haman plots to designate a day to begin a genocide against all the Jews in the Persian Empire and convinces King Ahasuerus to sign the decree. It is then that Esther recognizes that there is purpose in her being chosen as queen; in the right place at the right time, so she begins to use her position for the good of the Jewish people. She does save the day. So back to ... who runs the world? Women! When you read the complete story of Esther, with all its plots, subplots, twists and turns, which I encourage you to do twice during the holiday, you are struck by one very significant fact: G‑d seems to have gone missing. G‑d is in the details, but nowhere in the text. In every one of the Jewish holiday stories, we speak of G‑d’s blockbuster miracles, the splitting sea, the lighting, the thunder, the oil, the cloud of glory and so forth. This holiday is no different. It has a big miracle: The Jewish people are saved from certain death! And to read the story, you wouldn’t even know it. It’s easy to become enamoured with all of the coincidences and chance events: Esther is picked as the queen; Mordechai is her cousin, so she has the pulse of the entire Jewish community; Mordechai happens to save the king’s life; the king happens to have a sleepless night; Esther convinces the King. Is it all just extraordinary good luck? Perhaps some see it that way. But the message of Purim is to see it in another way. In a G‑dly way. The very name Esther means to “conceal,” and Megillah has the same root word as “reveal.” Megillat Esther is telling us that we need to reveal that which is concealed. Every. Single. Day. The Mishna brings home this point with an interesting principle. It states that if the Megillah is read backwards, from the end to the beginning (the way I read a magazine), one has not fulfilled the mitzvah of the day. Why do we need such a rule? It is telling us something more. If someone reads the story as if it happened in the past “backwards,” they are missing the point. This is not a story for the ages; it’s a story for today. Find G‑d in your story. All of us live lives that look like a series of chance, good luck and coincidences. But, in reality, it is all miraculous, and it should all be celebrated. It’s so easy to take for granted that which we deem normal and usual. So don’t. Don’t take it for granted, and don’t see it as normal. Appreciate all the small and seemingly insignificant things. people with whom we share this planet. Take the time to acknowledge the connections we have with each other, locally and globally. It’s not always easy. That’s why it is meaningful. It is a choice to make. Feel empowered. To look around and see that we walk in miracles every day is to reveal the concealment of the Divine/human relationship. Why is this important? (So important that when Esther and Mordechai write their story, they intentionally leave out G‑d’s name). Because this is how we develop an attitude of intention, purpose and gratitude. And then we ultimately can come to a child’s unbridled joy. So who runs the world? G‑d. But perhaps it will be the “girls” who let everyone know it. Dena Schusterman is a founder of Chabad Intown, the Intown Jewish Preschool and the Intown Hebrew School. 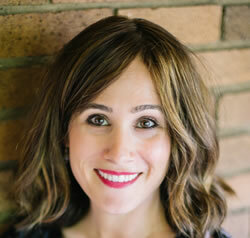 Dena writes about parenting and applied Torah and chassidic thought, and teaches women’s classes. Dena and her husband, Rabbi Eliyahu Schusterman, are native Californians living in Atlanta together with their children. Why Is Adar a Month of Happiness?